Ben Henderson’s new wobble was supposed to be the secret weapon he needed to save his career. But while his new baseball pitch ultimately missed the mark, his “revolutionary musket” still fired the first shot heard ’round the jazz world — leaving its mark as the first recorded use of the word “jazz”. While playing June Jazz at Tweetspeak last month, Maureen Doallas managed to hit one out of the park. You can catch the audio of her reading the poem in Thursday’s Top 10 Poetic Picks. But, really, everyone nailed down a good “jazz ball”, even shattering some windows in the process because we liked the sound of breaking glass. Now we’re ready to play with those shards. Shh. Get down on your hands and knees. Look at the pieces. Hold them up to the sun. Until the light speaks and guides your hand. This month, The Cento (a kind of mosaic poem) is our theme at Every Day Poems. Poetry invites us to reflect and focus on the beauty of fragments. We discover new patterns and artistry as we begin to sort through and rearrange those images and ideas. 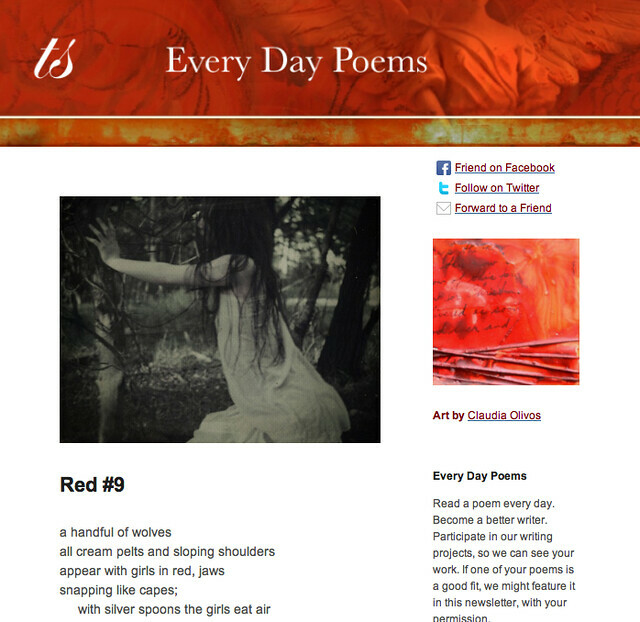 If you haven’t already, please consider subscribing to Every Day Poems. 1. On Mondays, the Every Day Poem in your inbox becomes a pile of raw material. Sort through the words and find a few gems. Rearrange as many as you want into a new found poem. You’re free to mix in your own words. 2. Tweet your poems to us. Add a #tsmosaics hashtag so we can find it and maybe share it with the world. 3. Or leave your found poem here in the comment box. We’ll read your tweets and share some of your weekly play each week. At the end of the month, we’ll choose a winning poem and ask the playful poet to record his or her poem to be featured in one of our upcoming Weekly Top 10 Poetic Picks. Here’s today’s Every Day Poem. Now go cool-arrange. Photo by Kejoli. Creative Commons, via Flickr. Post by Matthew Kreider. shards… what a fun idea! never thought of doing something like this before, mixing words found, like choosing crayons from a box! here I go giving it a try. “biligual” (llbarkat) took my breath away, i must say, and it felt more than a bit intrusive to dip into the perfectly placed words and shuffle them around… but it was fun and revealing – a bit meditative and reminded me of the zentangles drawing/doodle play. Donna, so glad you’re *in*! Looking forward to reading more as you piece together those meditations! Thank you for the generous words about “Confession”. I didn’t know when you asked for a recording that your intent was to feature it. So a double thank you, Matt. Fortunately, Dominion Virginia brought us back onto the grid; I recorded the poem this morning. Hope everyone enjoys it. I have a cento planned for a post next week. I will, of course, try my hand at today’s offering. That won’t be easy, given that the poem is LL’s! Well, I’m very glad DV got your power turned on, though I do confess a selfish perspective …The audio for your poem is just marvelous. It is mutual, of course. the fog that’s print to fit. “all/ the fog that’s print to fit.” I can feel that haze on my inky thumbs. Great line, Glynn. Feeling your hand laying over the mist of my flesh. The wind of you brought me back. Yay, Danelle! I’ve missed you. 🙂 Thanks for sharing your beautiful arrangement here. I haven’t tried to intentionally weave a poem together since I was in college. I had butterflies when I clicked “submit”. It’s kind of magical…. how everyone uses the same shards and creates vastly different wonderful pieces of mosaic! Reminding me of the fused glass class I’m going to take, only no band aids required! When this idea was first posted, I admit I was dubious, but it’s been amazing to me how generative the experience has been. And two last attempts…what a rich experience! of walking in the light.